Keep The Coffins Coming, the latest from Frank Iero & The Patience, or in this case Frank Iero & The Patients, in light of their 2016 van crash while on tour in Sydney, Australia, is meant as a bridge between his Stomachaches and Parachutes albums. 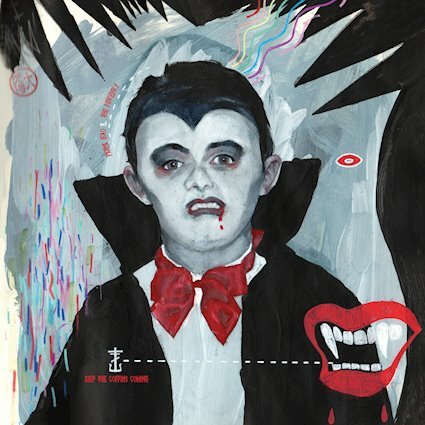 As if we needed a refresher course in the sheer spastic and unpredictable punk rock Iero and the boys are capable of shelling out, Keep The Coffins Coming opens with Parachutes’ standout “I’m A Mess,” before diving into the indie rock end of the pool on “BFF,” a rollicking endeavor with some explosive tendencies thanks a mixture of fuzzy riffs and sharp drum work filled with noisy cymbal crashes. Iero brings things right back to the garage on the corrosive and scathing “No Fun Club,” a pure blast of adrenaline straight to the heart that clocks in at only 1:34, before transforming into a traveling troubadour on the dusty and wandering “You Are My Sunshine,” trading in the song’s trademark wide-eyed optimism for something a bit more sinister to close out Keep The Coffins Coming, another home run release, even if it’s only four songs, a few of which we’ve heard before. Regardless, the music world is a better place when Frank Iero and the Patience are out there dropping records.